We see bubbles … lots of bubbles … in the Big Smoke! For the second year running, we attended the VM&Display Show at the Business Design Centre, The Angel Islington, London. And this year’s theme came from a moment of inspiration we had after last year’s event! On the way home in 2018, we spotted a traditional laundrette … black and white tiled floors … the marvellous ‘old school’ washing machines … bright lights … think 50s America and maybe the famous Levi 501 TV advert, if you’re of a certain age (scarily, this was first aired in 1985!!!) And pop! This year’s theme was sorted. You could say we were squeaky clean in 2019 as the laundrette theme really inspired us. In the run-up to the event, we involved young people from our local community to help us prepare our stand. The Futureworks NY team re-cycled about a zillion plastic drinks bottles into bubbles. Yes, bubbles … and lots of them! We then asked talented graphic artist Savannah Storm to create the washing machines in a fabulous shade of pale turquoise, complete with stripy washing inside! 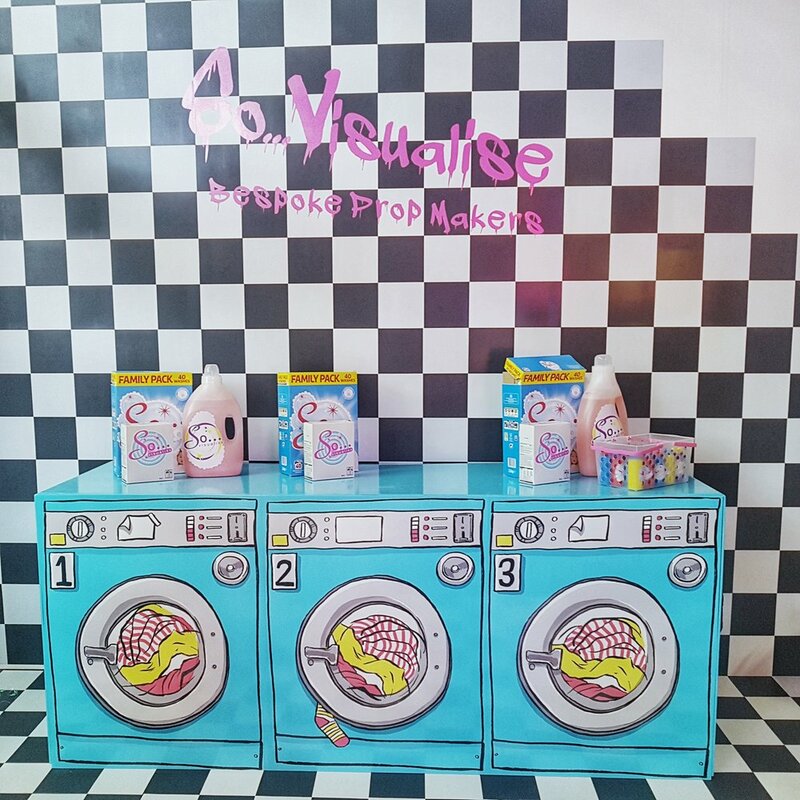 The bubbles and other water-effects cascaded down the side of our stand and we even had our own range of So… Visualise washing aids ... other cleaning products available! We drove down to the VM&Display Show ready for set up on the Tuesday and as this was our second visit, we knew what to expect and also saw old friends from last year. So… that was ‘a load’ off our minds! 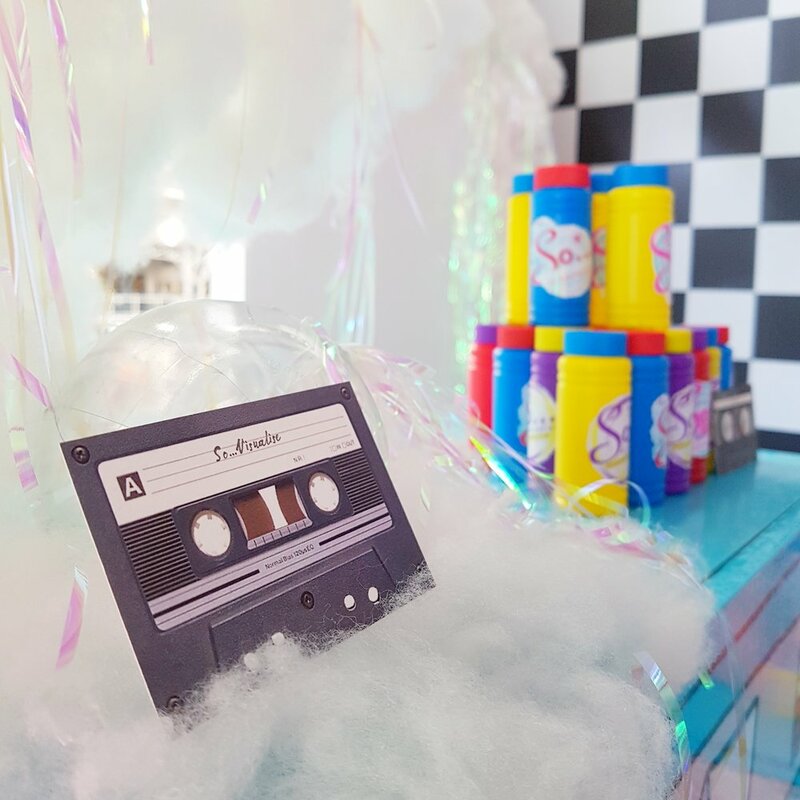 We were then ready for the show (Wednesday 3rd and Thursday 4th April) and our branded bottles of bubble mixture were an immediate hit … after all, could you resist blowing bubble through that special wand? The show was busy, busy, busy and we made some excellent contacts. And while making contacts and reconnecting with potential clients is one of the main reasons for attending, this year’s USP was also the involvement of the Futureworks NY team. This amazing organisation helps young adults find their potential when other ways maybe haven’t always worked out. Collaborating with them was hugely rewarding and we’ve since worked on another project for L’Occitane with this amazing team! Our stand has also been featured on the Retail Focus website, which is fantastic. We are hoping to attend next year … ‘wash’ this space! Here at So… Visualise, we’ve been working on one of our most successful projects so far. It had nothing to do with travelling to an exotic location, a bustling metropolis like London or meeting up with company executives. We’ve been much closer to home … in fact, we’ve been working right here in sunny Scarborough with old plastic bottles. Honestly! Allow us to explain. Next month, we’re heading off to the Visual Merchandising and Display Show in London for the second year running. And we’re so … excited about this! Yet we needed to prepare our stand so it would ‘stand’ out from the hundreds that ‘set out their stall’ for the event on April 3rd and April 4th at Angel Islington in the capital. As a business that firmly believes in giving back to the community, we approached Futureworks NY of Scarborough to see if they would be interested in helping us get ready for the London trip. If you’ve not heard of Futureworks NY, they’re an amazing organisation that helps young adults ‘find their way’ in a world that can be confusing and very challenging as they make their way into adulthood. 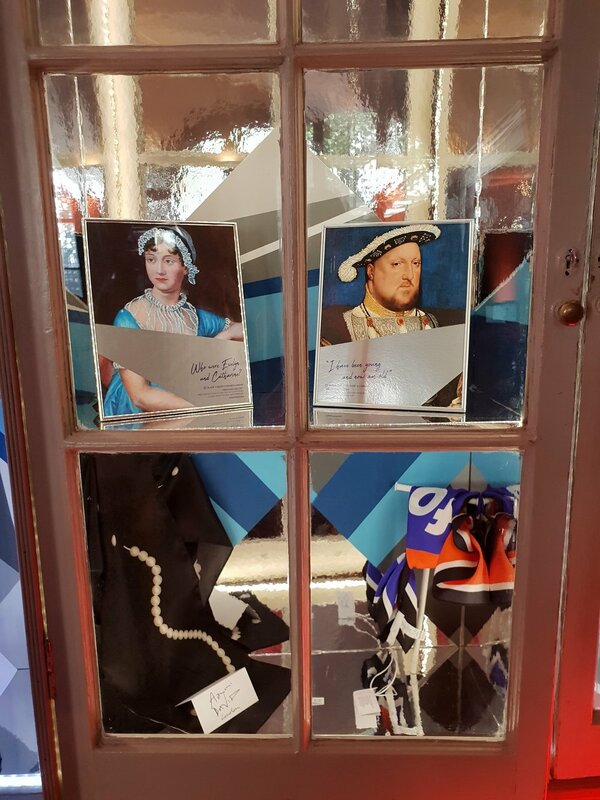 We tasked the students, aged 14 and above, with a creative challenge … re-purposing plastic drinks bottles into fun bubble shapes which would be on display to the great and the good of the visual merchandising world. We reached out via social media for bottle ‘donations’ and we were soon well stocked for our project. The time we spent with the students was so … rewarding! We had two sessions a week in which we could join forces at their workshop. The challenge gave our students the chance to follow a design brief from start to finish, to see that creativity is something that is truly valuable and also see there is a chance to succeed here in their home town. We worked alongside the Director of Futureworks NY, Sarah Thornton, who was delighted with the result. We’re so … chuffed at the result. We can only say how wonderful it’s been and maybe other businesses could benefit in a similar way … getting young people involved and giving them hope, and an insight into a world that is waiting for them and their talents. Sometimes talents are hidden or need a little bit of encouragement to emerge. We sincerely hope we’ve been able to inspire and allow these fabulous young folks to ‘visualise’ a positive future for themselves. So... what was our project? If we said an upside down flower display that would 'float' above people's heads, you might have thought we'd had one too many Proseccos! Yet our brief from the L'Occitane team was to provide an immersive floral experience. As the cloak of winter wrapped itself around us, here at So … Visualise, we’ve had a glimpse of spring by way of fresh colours, varied textures, and floral inspiration thanks to the world-famous beauty and skincare company. L’Occitane’s stylish retail outlets can be found worldwide and their products are beautiful to see, touch and smell, showing the very best Provence has to offer. So… how did we help this iconic French brand? If you’re a follower of fashion, then you’ll know London Fashion Week took place from 14th to 18th September, darlings! So Visualise had an artistic presence at a prestigious prelude event to London Fashion Week earlier this month.This high profile VIP curated event was held from 13th-16th September at the Old Central St Martins college in Holborn shining a spotlight on the world's fashion calendars main event London Fashion week, showcasing designers from around the globe. Our artisan makers of the weird and wonderful had the great honour of creating numerous design pieces for this iconic show, used in strategic areas as the world’s greatest designers mingled and had a few ‘tete a tetes’. So… when we received the design brief, it was eclectic and from the moment we got the list, we knew this would give our creators and ‘au courant’ designers a challenge. The brief included 18 hand crafted geo puzzles in a spectrum of four hues presented in elegant bell jars. Forget the brightly-coloured Rubik’s Cube, these babies were carefully constructed cubes that had an Escher-like never-ending quality, together with a luggage tag featuring the phrase ‘Lift to discover Tom Ford’ in handwriting that would delight any calligrapher. 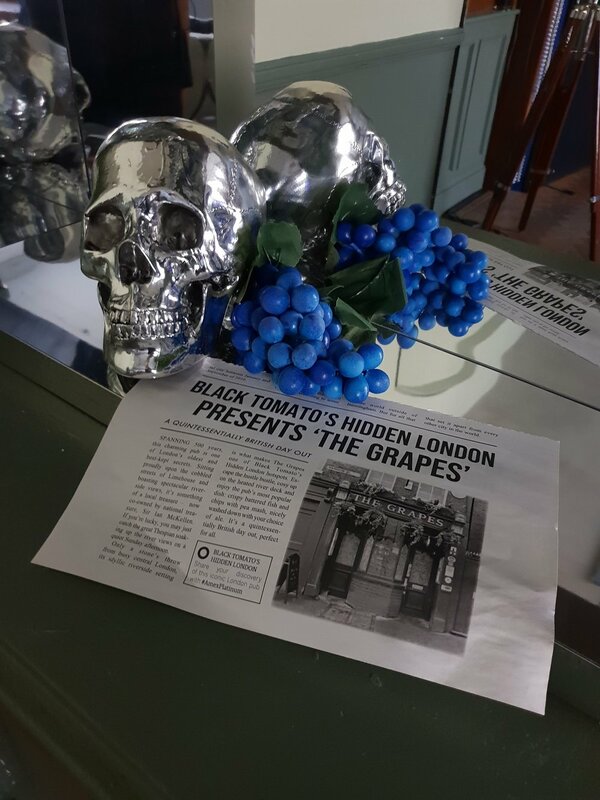 We were then asked to create half a dozen silver skulls with Pantone®-matched blue sprayed bunches of grapes along with a personalised newspaper article. Together these looked amazing, chic and memorable. If you love a three piece suit and a traditional accoutrements, then So… Visualise were asked to create two bespoke printed pocket squares, hand-printed on shiny satin material which then nestled perfectly in the pocket of a navy blue jacket resting on a dress-makers mannequin. 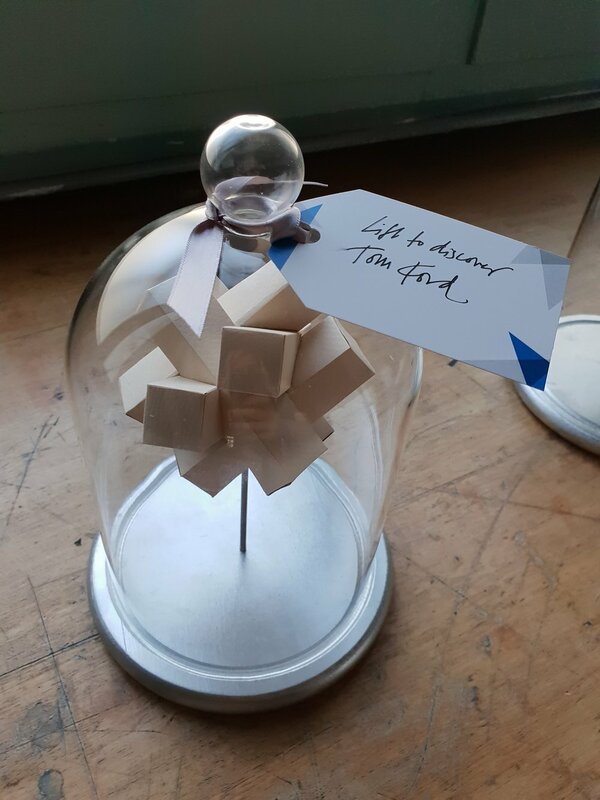 Next, we all know that if you’re superstitious, then avoid breaking a mirror for fear of seven years’ bad luck … however, for London Fashion Week this was not a consideration as we were briefed to create half a dozen cracked mirror effect books that were hollow inside. Each tome housed a magnifying glass and personalised text that rested in the small, comfy space within. Finally our commission asked us for some giclee printed portraits with painted artist details overlaid with bespoke vinyl print. For those of us unsure as to what a giclee printing involves, let us enlighten you … this process uses fade-resistant, archival inks and is used by artists for reproduction purposes (for example to make a reproduction of a single, one-off piece while preserving the original). There is a theme to these seemingly disseminated works … there was a strong grey, blue and black colour palette; there was a theme of the printed word in transient times; and together they all looked incredible. 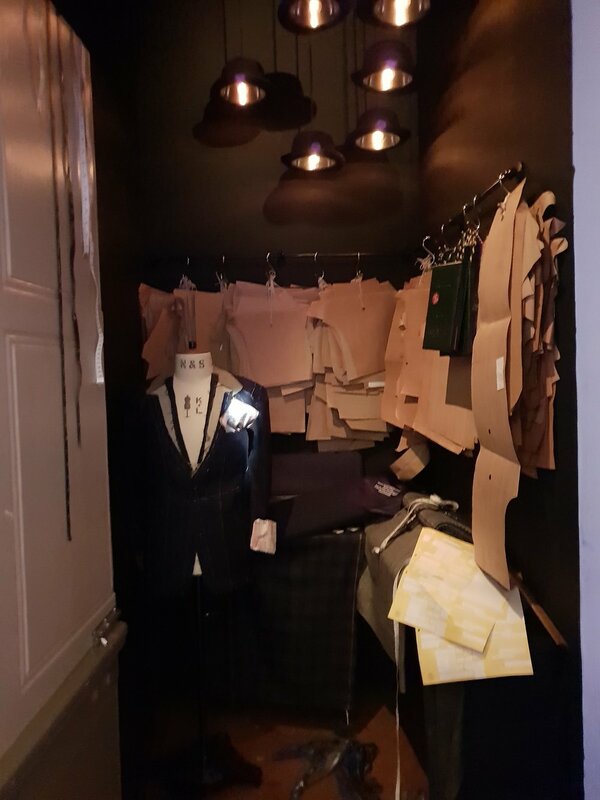 This commission was one we won’t forget and the outcome was testament to our teamwork and our strong position in the bespoke creation industry. So...did you know Salvador Dali and Andy Warhol created incredible visual window displays? Eekk we made it in a mag! Oooh what a lovely week this has been! So...the build up. We were recommended by a lovely florist called Sarah who we had enjoyed working with previously to join her in creating this relaxed barn wedding for Adam & Fergus. Of course a great success on the cool spring April day and all went beautifully. So lookey here it is 3 whole pages none the less and we couldn't be happier! Creative Director, Lisa Borrie, heads to London with an invitation to the Queen Bees Christmas networking dinner. After previously meeting with Phoebe Gormley of Gormley & Gamble female tailors of Saville Row, I was very kindly invited to their Queen Bees Christmas dinner at her residence. Not your usual networking event where you have a name sticker and you are all stood around hoping it was worth coming. Queen Bees is a fantastic small group of fab ladies who are owning it at the minute! Talking about the highs and lows of running your own business. We were sat chatting like friends by the end of the evening and offering advice to each other over a glass of wine. So ...ready for the next one!